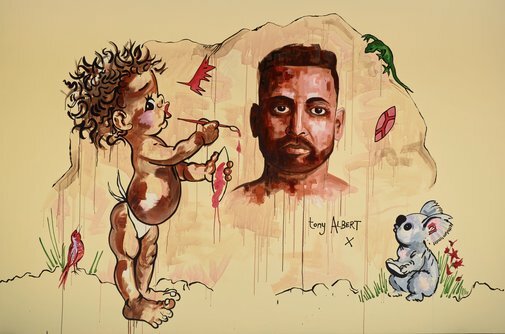 In Tony Albert’s self-portrait he appropriates Tinka, the fictional Aboriginal character illustrated by Brownie Downing, to comment on the influence of Aboriginalia in the construction of identity. ‘Downing painted the Australian bush and its native inhabitants in an art career spanning several decades. Her most successful subject was Aboriginal Australia in an idealised form. Her “piccaninny”, Tinka, was an emblem of the childlike native destined for race rescue. The future place for “Aborigines” within civilisation was as domesticated bric-a-brac,’ he says. ‘I really loved these images as a child, which is when I started to collect what I call “Aboriginalia”. As a teenager, I started to look more closely at the social and political implications behind this imagery. What looks soft and coy is really a continuance of the oppressive and often violent history Aboriginal people have lived through since colonisation. Born in 1981 in Townsville, Queensland, Albert has a degree in visual arts from Griffith University and is a founding member of the Brisbane-based Indigenous art collective proppaNOW. In 2014, he won the Basil Sellers Art Prize, the Telstra National Aboriginal and Torres Strait Islander Art Award. This is his first time in the Archibald Prize.